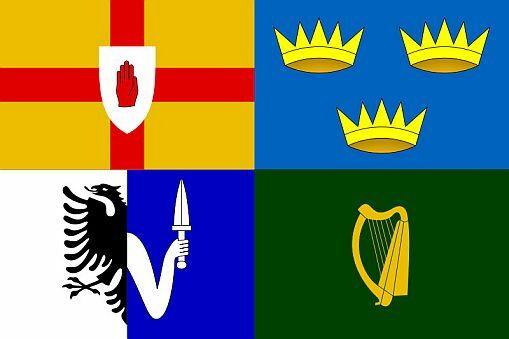 Today, Ireland’s four provinces form an important part of both the GAA All-Ireland Championship and its Rugby teams. The geography of ancient Ireland is rooted in myth and legend, and so the degree of certainty about anything geographical diminishes the further back in time we look. Today Ulster contains the counties of Donegal, Derry, Antrim, Tyrone, Down, Fermanagh, Monaghan, Armagh, and Cavan. Cavan, Monaghan, and Donegal are in the Republic; the remainder constitutes Northern Ireland. In ancient times, the extension of Ulster was determined by the presence of the Ulaid, the people of Ulster. Louth, Monaghan, Armagh, and Down were all certainly part of ancient Ulster; but the identification becomes more vague moving south and west. Munster (Mumu) contains the present-day counties of Clare, Tipperary, Limerick, Waterford, Kerry, and Cork. In ancient times, it had no clearly defined capital because control of the province is not associated with strong dynastic rule. Leinster (Lagin) contains the present-day counties of Louth, Meath, Westmeath, Longford, Dublin, Kildare, Offaly, Laois, Wicklow, Kilkenny, Carlow, and Wexford. In ancient times, like Munster, it had no clearly defined capital and did not include Meath or Westmeath. Connacht (Connachta) contains the present-day counties of Mayo, Sligo, Leitrim, Roscommon, and Galway. The ancient capital was Crúachu (Rathcroghan, Co. Roscommon). A few of the legendary figures associated with this province are King Ailill and Queen Medb. Knocknarea, near present-day Sligo, is the legendary burial place of Medb. In mythology, Connacht is the enemy of the Ulaid. Meath (Mide) seems to have contained what are now the counties of Westmeath and Meath. These counties now form part of modern Leinster and border areas of Ulster. The ancient capital was Temuir (Tara), and the Uí Néill dynasty is associated with it. The eastern part of Meath is also known as the kingdom of Brega.